Every time I walk from the flame to Centre block on Parliament Hill and look up at the Peace Tower, I'm filled with a sense of history, destiny and goodwill. The majestic buildings, rising from the high bans of the Ottawa river, seem so right and trustworthy. At our country's inception, the Fathers of Confederation chose the term "dominion" from Ps.72: "He shall have dominion also from sea to sea and from river to the ends of the earth." Growing up in this country, it seemed to me that a biblical vision shaped our very soul. But now as we stand at the transition of millennia, this country, symbolized by that Old Testament text and its unabashed recognition of the role of God in life, has undergone a radical shift. Canada seems almost embarrassed to admit to its spiritual heritage, except perhaps to mention it in a funeral of one of its political greats. 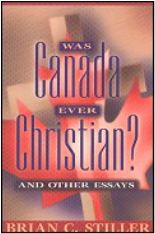 To ask ourselves the question "Was Canada ever Christian?" is critical, for it helps us understand our roots and provides us with insight for our future journey. This is not to reminisce with the assumption that we have lived in a "golden era," but rather to be reminded of the vital place that Christian faith has played in the building of Canada. Will A Religious Right Rise In Canada?